At the heart of the EU in Brussels. Photo © Clive Dellard. 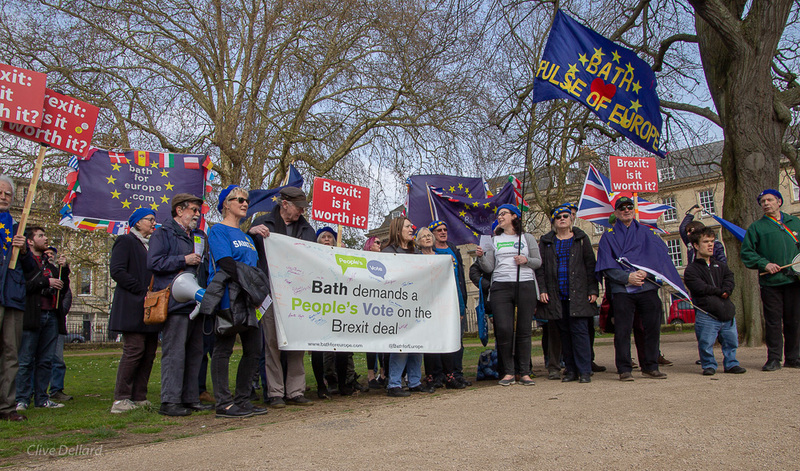 Remain Campaigners from Bath for Europe and Bristol for Europe made a huge impression when we travelled to Brussels this week. Our 26-strong group, many wearing our EU-themed “Bath Berets”, created a major stir as we as met with senior politicians and officials from both the European Parliament and European Commission. 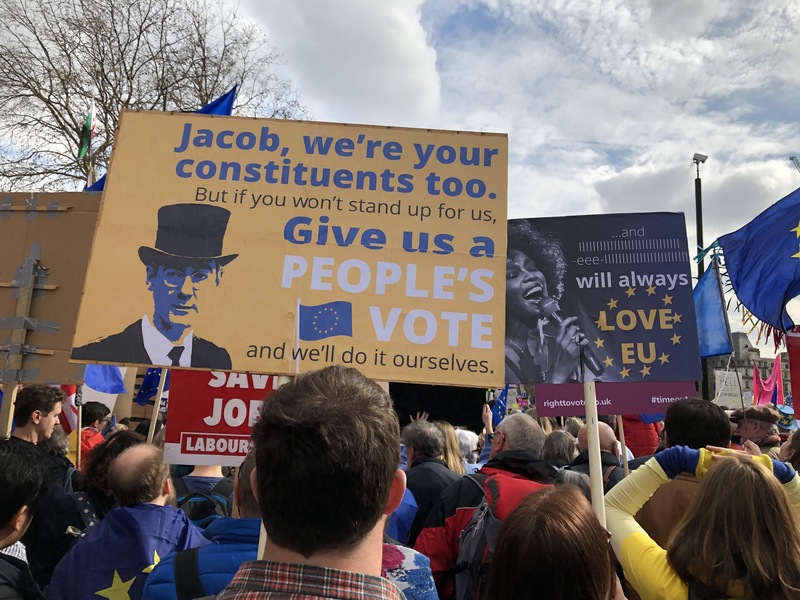 The aim of the visit was to raise awareness of grassroots campaigning in the UK for the Remain cause and help ensure that Brussels politicians recognise that the views of a large proportion of the electorate are being ignored whilst the government pursues a hard Brexit agenda. We were hosted by Molly Scott Cato, MEP (Green) for the South West. This meant that part of our travel expenses were subsidised. We urge all Remain groups to get in touch with their MEPs to arrange trips to the EU. Striding from one meeting to another through the European Parliament building. Photo © Clive Dellard. We met with a number of high-profile EU officials with expertise in international trade, citizens’ rights, regional development and security and defence, as well as executives from the office of Guy Verhofstadt, the European Parliament’s representative in the Brexit negotiations. We received an overwhelmingly positive reception from the EU officers, many of whom praised the UK’s contributions to the European Union and believed that Brexit would be damaging to Britain’s economy, risking trading relationships and regional aid. We also learned about threats to the rights of EU citizens who were living in the UK, as well as British nationals abroad, although EU negotiators assured the campaigners that they were working hard to achieve the best outcome for all. The “Irish question” was also widely discussed, as well as the government’s “red lines” which could determine the type of Brexit negotiated. The EU representatives were extremely sympathetic to the group’s desire for a “Final Say” vote to be given to the British and insisted that Article 50 could be revoked. We all had a seat at the EU table. Photo © Clive Dellard. Additionally, we met with several MEPs, including Molly Scott Cato (Green); Claire Moody, Seb Dance and Wajid Khan (Labour); and independents Julie Girling and Richard Ashworth. There were positive talks and sharing of campaigning experience with The Final Say For All Foundation, a group of UK citizens living in EU27 countries, whose lives are being deeply affected by Brexit, but who were denied a vote in the referendum. When not in meetings and moving around the Parliament buildings, we created further awareness of the UK Remain movement as many workers, visitors and journalists came up to ask us about our distinctive EU berets and our activities. Bristol for Europe campaigner Stephen Perry made an impromptu speech outside the Parliament building which attracted much attention! Our peaceful protest in front of the EU Parliament. Stephen Perry of Bristol for Europe gave an impassioned speech expressing our desire to remain in the EU. Photo © Clive Dellard. As we gained a deeper understanding and appreciation for the EU, many of us felt a sense of acute loss at the prospect of Brexit. 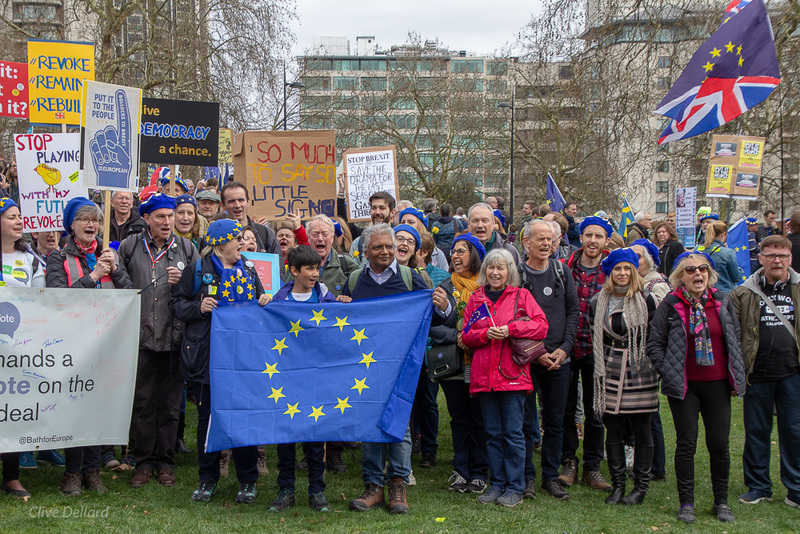 After a busy three days, we came back fired up and ready to continue with our campaign, including the South West March & Rally for Europe on Saturday 24th March in Exeter, one of numerous regional marches taking place around the UK on the anniversary of the triggering of Article 50. One of our group distributed our popular Boris Banknotes on the Eurostar on the journey back.